There is a saying, “Architects shape structures, after which the structures shape us.” This can be relatively said of the nation builders, the visionaries, the pioneers, the dreamers and doers of progress. In fact, when architects create space to form a mass, they envisioned how structures will be used and operated in a given society. We all have heard about the social consequences of architecture and architects having a responsibility to the community when they create a piece of architecture. But do architects and architectural firms have social responsibility that goes beyond their practice? The social responsibility of architects is partly believing that architecture can create better places, that it can affect society, and even has a role in making a place civilized by making a community more livable. This is actually one of the basis of a good architecture. Making a place civilized is putting order to man’s environment where he will eventually utilize all man-made and natural environment created for him. Architects want to believe that architecture affects life’s quality. As members of society, they can affect the quality of life in their communities through involvement beyond their practice. As citizens, we can influence social conditions and even be the cause of positive social change. Very few of us would choose to give up all personal possessions to help the poor or dedicate an entire life to a cause. But many of us want to make a contribution to society. Many of us would likely be willing to give time or financial resources to help the marginalized. This is now the social responsibility architects feel they should get involved with. You will find an architect joining a city development board or a tourism-related activity or a heritage conservation group as a consultant. He can be a vocal activist, or be part of a relatively quiet influential group that can shape the outcome of a community or society at large. An architect can be found involved in countryside community development, or a religious-related social community work or a research group working on the social dimensions of less fortunate people. Architects feel the environment they created or have been a part of will in fact be better if they put things in proper context of man’s way of life. There is something in social responsibilities that architects foresee which other professionals can’t. The architects can see into the future and look at the possibilities of doing work for a community. They know fully well such social work may not be interesting to business groups or even to government-related agencies that may lack resources to effect change. They hope of bringing it to life, wondering of the infinite possibilities the community can attain. And this is where the architect’s direction brings them to. That of making a social responsibility happen. Seeing that responsibility takes shape in the context of what they have built. 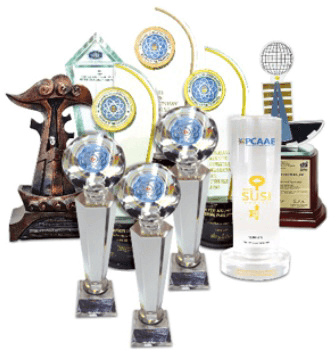 There are so many socio-civic groups doing social responsibilities. In most probability, the projects often related to shelter or vertical structures always have an architect as the chairman or head. This proves that the architect is the master builder in vertical structures related to the environment. 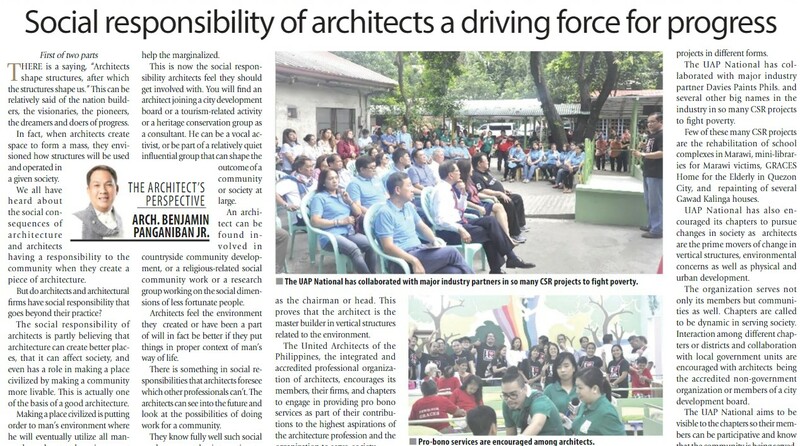 The United Architects of the Philippines, the integrated and accredited professional organization of architects, encourages its members, their firms, and chapters to engage in providing pro bono services as part of their contributions to the highest aspirations of the architecture profession and the organization to serve society. Every member of the UAP can support and further the values of the institute in terms of its advocacy for sustainable design and practices, diversity, and elevation of the stature of the profession of architecture. This is their way of giving back to society what architecture has blessed them. UAP has also instituted a Committee on Corporate Social Responsibilities called the Bayanihang Arkitektura chaired by Arch. Rene Ritchie Corcuera. Here, UAP engages in CSR projects that focus on elevating the plight of people deprived of a decent way of living, shelter, livelihood and dignity. Bayanihan Arkitektura is the coming together of architects as one to uplift the lives of others. Through pro bono efforts, architects partner with allied design professionals to offer the opportunity of bringing a unique combination of a knowledge-based and design skills to address a wide range of issues facing communities. The ability to provide professional quality services is greatly enhanced by the expertise architects possess in managing resources (human and financial), time, and in understanding the complexities inherent in the procedures required by the state and local governments. The outcome is normally a successful endeavor. UAP makes it a point to share the blessings of the architects work with their industry partners. It is in tapping the resources of industry partners the appreciation of UAP’s CSR projects is achieved. The fulfilment and joy of seeing the projects come to life to serve its purpose is a blessing o UAP and industry partners. The vision of letting architecture be known to the public becomes a reality as UAP undertake more CSR projects in different forms. The UAP National has collaborated with major industry partner Davies Paints Phils. and several other big names in the industry in so many CSR projects to fight poverty. Few of these many CSR projects are the rehabilitation of school complexes in Marawi, mini-libraries for Marawi victims, GRACES Home for the Elderly in Quezon City, and repainting of several Gawad Kalinga houses. UAP National has also encouraged its chapters to pursue changes in society as architects are the prime movers of change in vertical structures, environmental concerns as well as physical and urban development. The organization serves not only its members but communities as well. Chapters are called to be dynamic in serving society. Interaction among different chapters or districts and collaboration with local government units are encouraged with architects being the accredited non-government organization or members of a city development board. The UAP National aims to be visible to the chapters so their members can be participative and know that the community is being served. Lastly, the chapters are urged to make sure their projects are result-oriented.